Book Making: Is Chapter 11 the final chapter for Borders?GE bets big that it's not. Is Chapter 11 the final chapter for Borders? GE bets big that it's not. in annual sales lose $168 MILLION? Ask the bosses of Borders. This weekend could be a great time to save money buying books at Borders. As part of a Chapter 11 bankruptcy plan filed yesterday, Borders -- the nation's second-largest bookstore chain -- plans to close 200 of its 642 stores in two weeks, with clearance sales starting Saturday. The store near me (which is much less convenient than my nearby B&N) is on the closing list, and up to 136 additional stores could close and 6,000 workers could lose their jobs. Borders boss Mike Edwards said he hopes the company will become "a potentially vibrant national retailer of books and other products." Borders received $505 million in financing led by GE Capital. That's a substantial vote of confidence, which, sadly, may not be justified. The bankruptcy comes after multiple turnaround plans -- including new management, firing thousands of employees, numerous store closings and bargaining with creditors -- have failed to keep Borders solvent. British Borders stores (no longer related to the US business) closed in 2009. Borders suffered from online competitors, big-box competitors such as WalMart and Costco, failure to capitalize on eBooks, clinging to the failing CD business, expensive leases, and clueless management. It had revenue of $2.3 billion last year and recorded losses of $168.2 million through Dec. 25. Borders Group stock, which closed Tuesday at 23 cents a share on the New York Stock exchange, ceased trading upon the bankruptcy filing. Borders listed $1.27 billion in assets and $1.29 billion in liabilities in its Chapter 11 filing. 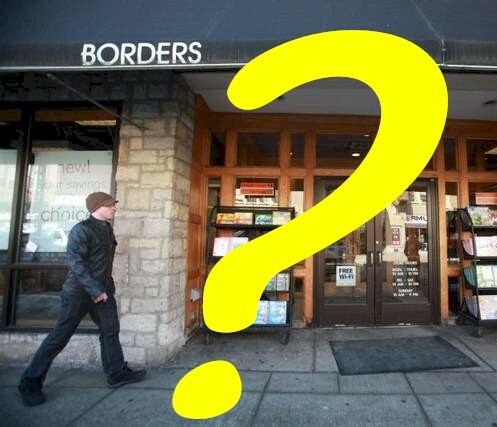 The filing said Borders has fewer than 50 creditors, mostly publishers. The top creditor is Penguin Putnam, which is owed $41.1 million. OUCH! "If publishers are lucky, they'll get back 25 cents on the dollar," said Jed Lyons, chief executive of Rowman & Littlefield Publishing Group, which publishes its own titles and distributes books for other publishers through its National Book Network. Borders owes National Book Network $2 million. Shopping center owners -- still suffering from the closings of Circuit City, Linens 'n Things and other retail chain stores -- will now have to deal with still more large empty spaces. It has often been said that book publishing has lost its soul, and that the huge publishing companies are now ruled by ruthless beancounters who care little about literature. It amazes me that the beancounters at these media giants were so deaf, blind and clueless that they kept extending credit to Borders as the company was obviously swirling down the toilet bowl. I don't have an MBA and am not a CPA, but I knew enough not to try to sell my books to Borders. Is GE Capital as dumb as Simon & Schuster? Is a bookseller as worthy of a federal bailout as a carmaker?